As the 2013 official SXSW t-shirt sponsor, Gap took to its social media channels to activate a series of free-spirited fashion and music themed content and events in Austin, San Francisco, Los Angeles and New York. From launching the brand’s official Tumblr site, to curating personalized content across Pinterest, Instagram and Vine, companies and brands can look to Gap’s efforts as a way to rally their social communities around an event integration. 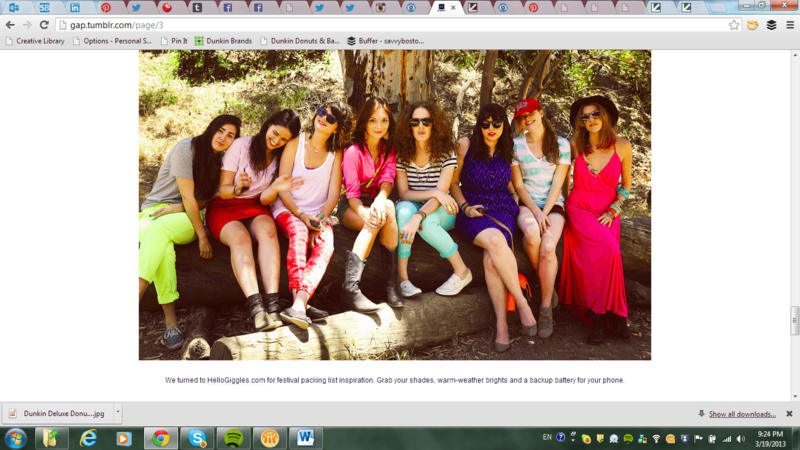 Featuring the brand’s iconic logo and the phrase, “Be Bright,” Gap’s Tumblr site was created in conjunction with SXSW. The feed is a single column and features large, colorful images, the occasional GIF and SXSW event invitations. The content is centered around fashion and street style tips, plus images of parties and concerts you wish you went to. 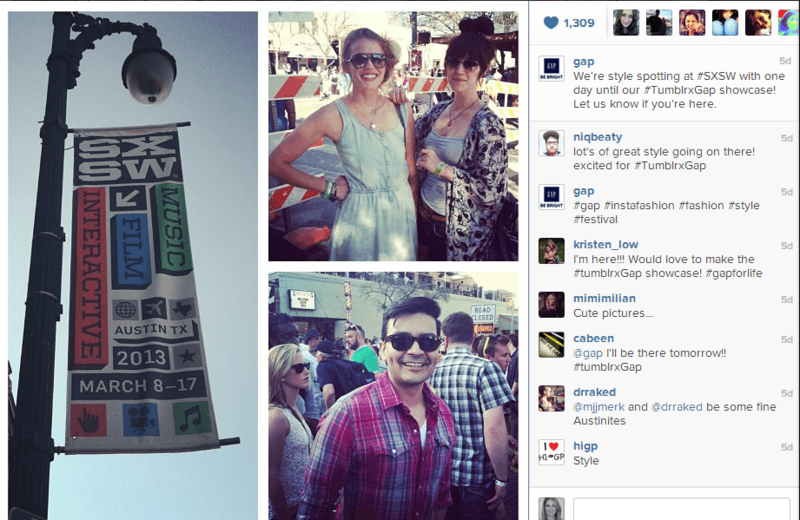 In addition to Tumblr, Gap also curated a serious of personalized SXSW content across Pinterest, Instagram and Vine. On Pinterest, Gap has a Festival Style board dedicated to free-spirited fashion and music with more than 19,900 followers. On Instagram, Gap mixed in SXSW photo collages from events and style spotting expeditions around Austin to its 95,000+ followers. The captions included a custom hashtag, #TumblrxGap, and asked followers to let them know if they would be in Austin, to which they generated a positive, enthusiastic response. On Vine, Gap also shared a few SXSW videos to its 2,500+ followers, which included snippets of live music and behind-the-scenes footage at the TumblrxGap House. Curate personalized content across platforms, but keep the theme consistent. Gap did a great job of this – all of the images and content have a consistent look and feel, but were strategically shared where they would be the most engaging to their social communities. To brand or not to brand? Don’t feel pressured to brand everything. Instead, look to how Gap focused their content strategy around the theme of free spirited music and festival fashion. Their highly visual content perfectly captured the spirit of SXSW and aligned their brand to the event without feeling commercial. Go behind the scenes. While they directly engaged with fans at SXSW, Gap also reached a much broader audience by sharing videos from concerts they hosted on Vine, behind the scenes video of a party and photos of festival goers. 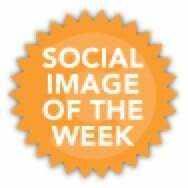 Use your social media efforts to bring people to the event that can’t physically travel there. It’s OK to multitask. During this timeframe, there were (gasp) other things going on besides SXSW. Meaning, despite playing an important role in SXSW, Gap still posted content not related to the event. It’s smart to diversify your content strategy, as not all fans may be interested in an event or sponsorship. Rely on real-time social listening and community management. Given the investment required to activate an integrated social campaign (people, creative, hours, dollars), social listening and real-time insights from your community manager are your ace in the hole. Be nimble and flexible to adapt content in line with fan feedback, as it could greatly impact the success of your campaign.